Just shy of a year ago, I took a long weekend trip with girlfriends to Boston. There, I fell in love with the North End neighborhood which highlighted Italian cuisine and culture. I thought about that trip the other day and that's when I was inspired to make an Italian inspired dessert. While on my trip, I indulged in so many sweets but one that is synonymous with Italian cuisine is the famous cannoli. I wasn't feeling quite that ambitious to make authentic cannoli so instead, I made Cannoli Cupcakes! If you've never had a cannoli, I highly recommend you try one the next time you have the opportunity. These crispy, pastry tubes are filled with a sweet ricotta cheese mixture kissed with a little Marsala wine that often also includes citrus peels, chocolate chips, chopped pistachios and even a maraschino cherry to put them over the top. In applying the flavors of a cannoli into a cupcake, I was fortunate enough to come across Sugarcrafter's blog where she made a recipe for cannoli cupcakes. Her recipe involved adding Marsala wine, orange zest and chocolate to the cake batter and frosting these cupcakes with a cannoli filling. I adapted her recipe where I omitted the chocolate from the batter and instead of using the cannoli filling as frosting, I filled the center of each cupcake with it. 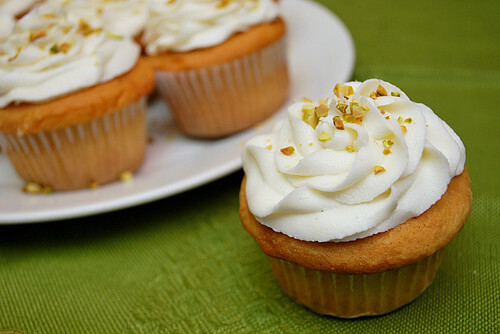 As for the frosting, I made a traditional vanilla buttercream and garnished with pistachios. 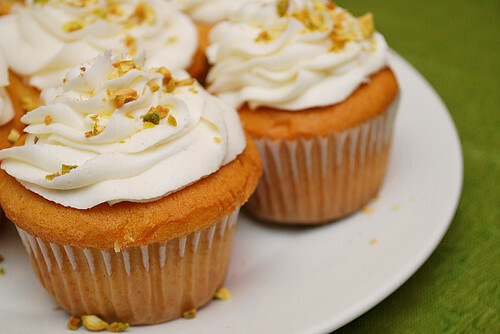 So if you can't get to a cannoli fast enough, these cannoli cupcakes are the next best thing! Mangia! Preheat the oven to 375 degrees and line two muffin pans with cupcake wrappers; set aside. Combine all of the dry cake ingredients together in a medium bowl. In a different, larger bowl, mix together the butter, eggs, vanilla, Marsala wine, and milk. Add in the ricotta cheese, orange zest, and powdered sugar to the wet ingredients and then add in the dry ingredients into the wet ingredients until combined. Pour the batter into cupcake liners, 24 in total. Bake for 20-25 minutes. 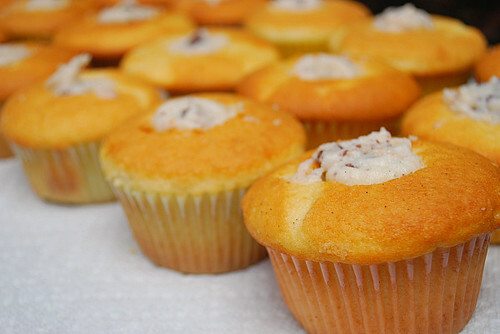 Remove the cupcakes from the muffin pans to a cooling rack. While the cupcakes are cooling, make the cannoli filling. To make the cannoli filling, stir together the ricotta cheese and confectioners' sugar using a spoon. Fold in the orange zest and chopped chocolate. When the cupcakes are cool, cut out the middles of each cupcake and using a pastry bag, pipe the cannoli filling into each cupcake, about 1 heaping tablespoon. After all the cupcakes have been filled, make the buttercream frosting. Add confectioners’ sugar and salt; beat at medium-low speed until most of the sugar is moistened, about 1 minute. Scrape down the bowl and beat at medium speed until mixture is fully incorporated, about 30 seconds; scrape bowl, add vanilla and heavy cream, and beat at medium speed until incorporated, about 20 seconds, then increase speed to medium-high and beat until light and fluffy, about 4 minutes, scraping down bowl once or twice. Pipe the filling into a pastry bag and frost the filled cupcakes as desired. Garnish with chopped pistachios. * If not serving right away, store chilled since the filling involves ricotta cheese. These cupcakes will hold at room temp for up to 4 hours safely. Yummm!! !1 I love this idea! These look AMAZING! I love cannoli, so I will most certainly be trying these soon. Great idea for a cupcake. Uhhh...wow. These look totally incredible. Oh dear lord, these look so good and what a brilliant idea!!!! I'm book marking this recipe and I'm going to try it out!!!!! Amazing idea! This look great! This caught my eye straight away. Love the idea of a cannoli cupcake, I love cannolis. Thank you for a great recipe! Fabulous cupcakes, love the idea! I can just imagine biting into one of those with its delicious filling. Yummy. Lovely decorating job as well. So creative and delicious - thanks for sharing Joelen! Do these need to be refrigerated because of the ricotta filling? Hi Jessica! Thank you for your comment & question. Yes, these cupcakes will need to be refrigerated if not served immediately. I've updated the recipe at the bottom to include storage and serving tips. Did you drain your ricotta? Jenny, I was fortunate to have ricotta cheese that was fairly dry so there wasn't a need to really drain. If you have ricotta that is more on the wet side, drain it by wrapping in cheesecloth and squeeze out as much moisture as you can. How important is the Marsala Wine? Can you use the Marsala cooking wine?